1st HAPPY NEW YEAR & Happy Birthday to ME!! Have you done all your neo-duties today? * Checked the news page for updates? * Completed all your dailies for freebies? * Played games to make 80k+? * Checked in with your guild? * Checked your stock portfolio? I'll be on vacation for the first 3 weeks of January starting today, so unfortunately I won't be able to update the answers to the faerie crossword and daily question. Use the arrow keys to move around and collect items that fall out of the Chia's bag. Use the spacebar to freeze the Chia. Bump into the Chia with your hear (not your body) to bump more items out of him. Collect the level's limit in order to continue on. REMINDER: You can send your score up to 5 times per day for Game Challenges while each one lasts! My name is Laura, but I go by Petchy on Neo. Been playing for about 7+ years now, and I'm still as addicted as I used to be. I live in Toronto, Canada, so I'm 3 hours ahead of Neo time. Depending on my work schedule I usually update between 7am-10am my time. I'm a Premium Member, so neomail me for an invite!!!! While you're reading up on me, please visit My Guild & my shop for the cheapest wiz prices! Petchy is on vacation for 3 weeks. See you then!! Hope you had a great New Year!! HAPPY BIRTHDAY NEOPET!!!!! see the Neopets Updates section for celebration details!! Sorry for the lack of updates my friends, I've been sick with a bug last few days. A good neopian was nice enough to let me know that there is yet ANOTHER Capri Sun game out there. Head over to the Quick 'N Easy Games now to play these easy games! What do you find most useful about my guide? UPDATE - SOME GAMES ARE UPDATED! I updated a few games, but I really need to get to work now. The ones with no pictures need to be changed to better games. However, the ones with pictures are updated and good to play :) ENJOY! Sorry for the lack of updates lately. Been working loads of hours to make money for my trip to the UK which I am leaving for tomorrow. Also, because of this I will not be updating the Crossword or Daily Question until I get back at the end of June. I will try my best to update the games as soon as possible after the ratio change. See you in a month!! ...you'll be a millionaire in no time! Hello! and Welcome to my neopoint making guide! So I guess you're wondering why I've made yet another neopoint making guide when there are already so many out there. Easy! Over years of playing neopets, I finally found a daily routine that brings in the most nps, and I want to share it with you. This guide has everything from clickable dailies to those insane games that bring you 3k each day (with up-to-date ratios!). So what are you waiting for?? GET TO MAKING THOSE NPS ALREADY! I hope you all had a safe and Happy New Year's Eve, and I wish you all only the best in 2011! Head over to the NC MALL now to claim your FREE Holiday Goodie Bag!! Since it's a Neo Cash freebie, you are also allowed to claim it on side accounts!! All neopians with accounts +60 months can purchase from the Hidden Tower today at a 3% discounted price!! Still need the FQD Avi? Today's your chance!! IT'S DECEMBER!!! You all know what that means! Every day for the next month, make sure to visit the Advent Calendar for great prizes and nps!!! Day 7 - FINAL DAY! Send Score Challenge: Send your score in any 75 Qualifying Game. Game Challenge: Send a score of 300+ in Meerca Chase. Secret Challenge: Send a score of 400+ in Trouble at the National Neopian . Random Challenge: Play 10 Qualifying Games, 1 from 10 different Neopian Lands. Send Score Challenge: Send your score in any 60 Qualifying Game. Game Challenge: Send a score of 200+ in Hasee Bounce. Secret Challenge: Send a score of 400+ in Bouncy Supreme . Random Challenge: Play a Qualifying Game with less than 2 million plays, and another game with over 20 million plays. Send Score Challenge: Send your score in any 45 Qualifying Game. Game Challenge: Send a score of 130+ in Kiko Match II. Secret Challenge: Send a score of 1,500+ in Destruct-O-Match III . Random Challenge: Play any Qualifying Game with a rating of 7+. Theme Challenge: Send a score of 150+ in Turmac Roll. Send Score Challenge: Send your score in any 30 Qualifying Game. Game Challenge: Send a score of 1,500+ in Meepit Juice Break. Secret Challenge: Send a score of 1,400+ in Snowmuncher. Random Challenge: Send your score in 3 Qualifying Game that are in your Favorites list. Send Score Challenge: Send your score in any 15 Qualifying Game. Game Challenge: Send a score of 300+ in Carnival of Terror. Secret Challenge: Send a score of 3,600+ in Ice Cream Machine. Send Score Challenge: Send your score in any 5 Qualifying Game. Game Challenge: Send a score of 450+ in Korbats Lab. Secret Challenge: Send a score of 10+ in Zurroball. Random Challenge: Add 3 Qualifying Games to your Favorites List. Send Score Challenge: Send your score in any Qualifying Game. Game Challenge: Send a score of 175+ in Math's Nightmare. Secret Challenge: Send a score of 50,000+ in Spellseeker. Theme Challenge: Send a score of 150+ in Extreme Herder 2 & 225+ in Gadgadsgame. Community Challenge: If everyone works together to reach a goal of 45 million gameplays, then those who sent scores during the event will get prizes. Yay! It's that time of year again! Here are the a bunch of things you can do while celebrating Neo's 11th year! All pets within levels 1 - 40 receive free training at the Swashbuckling Academy. Send game scores 5 times!! Play Buried Treasure for FREE! Snag a Limited Edition pet since they'll be randomly released throughout the day! 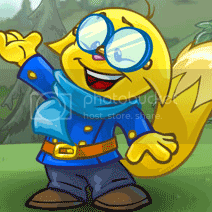 Unlock the Neopets Birthday avatar by visiting the News page. Need help completing the steps for the new plot? Featured Game = EASY 6k!! Yahoo!!! Kass Basher is today's featured game!! Head over NOW to make 6k is less than 5 mins!! Head over to Neopia Central NOW! Monthly Freebies & Bonju Avatar! DON'T FORGET TO COLLECT YOUR FREEBIES!!! Woo hoo! It's August, which means if you have the following items, you are eligible to get the Chef Bonju avatar!! Have the "Mad About Oranges" avatar active and mix the following at the Mystery Island Cooking Pot. Yep, you read that right! Just by entering the Style Showdown you will receive 150 NC FREE!! And if that's not enough, The Neopets Team are also giving away a goodie bag in the Petpet Park NC Mall to celebrate it's 1 Year Anniversary! So if you have an account set up, go grab your goodie bag which includes an item and 150NC FREE!! AUGUST = Chef Bonju Avi! Just a friendly reminder that it is almost August, and that means that those who have yet to get the Chef Bonju Avi can get it! Better late than never! If you haven't snagged your free goodie bags from the NC Mall yet, I suggest you do so now. Head over to the NC Mall Now! If your account is 60+ months, you are eligible to shop at the Hidden Tower with a 3% discount today! WOW! I can't believe it's already July!!!! There is a new GAME CHALLENGE! Seems TNT is playing with us again. It was mentioned in the news today that Tarla will be running around throughout the site. If you happen to find her, you will have the choice of items, neopoints, or the option to get a better look at what awaits behind her mysterious mist. Want a better chance at finding her? Head over to the boards now to see what others are saying. APRIL GAMES & Easter Cybunny Avi News! Yep, you read that right!! So head on over to the Games section and start earning your NPs!! AND...tomorrow is the last day to get the Easter Cybunny avatar if you don't already have it! Just send the Happy Easter (Animated!)" Neogreeting card to someone to unlock it! First off, today is April Fools Day, so don't be surprised if something odd happens on Neo today! Also, every year on April Fools you are able to get the April Fools Avi. Visit the News Page if you don't already have the avi. Hey ya'll! Apparently the game listed as the featured game, Edna's Shadow, is not the featured game! HOT DOG HERO is AGAIN!! YAY!!! What an easy 6k! Festival of Neggs & DD Prizes! IMPORTANT: If you have PREMIUM and are having a hard time finding your Negg for the quest, TURN OFF PORTAL! The Festival of Neggs starts today! Don't forget to check back every day to complete quests and earn great prizes! Daily Dare Prices are ready for you to claim! Visit the Main DD Page to claim your trophy and prizes! Last day for Daily Dare!! Today is the LAST DAY to play the Daily Dare games! So if you want a spiffy trophy, I suggest you go catch up NOW! REMINDER! 6 more days until DD is GONE! Are you up-to-date with the games? There is less than a week to catch up! Click here to learn about which spiffy trophy you can get depending on who you beat, and when you beat them. Happy Gadgadsbogen Day! & Featured Game!! If you don't already have the avatar, now is your chance! Visit the Gadgadsbogen Neopedia Article now to get the avi! Hot Dog Hero is today's Featured Game!! This is a super easy way to make 6,000 nps So get to it!! High scores reset & freebies! Also, don't forget to grab your monthly freebies! Featured Game = easy 6k Today! Dubloon Disaster is the featured game today which means you get DOUBLE the NPs!! Send your score at 277 for 2k each game! Description: Use the arrow keys to move around and collect all the dubloons without touching any mines. Another new avi has been spotted. It's an easy clickable. Click here to visit the pet lookup of one who is at least 1 year old. Got a Lenny? Get FREE Training! It's Lenny Day!! If you own a Lenny, don't forget to bring him/her to good ole Cap'n Threelegs for some free training ALL DAY! DAILY DARE IS BACK EARLY! A new round of Daily Dare started up today! Head over now and see if you can beat AAA! There is also a new avatar for voting on the Staff Tournament. FREE NC Mall Gift Bag! Visit the NC Mall to claim yours now! Watch 5 short adds and win NPS! Cure your pets every half hour! Click to pick up free nps or an item! See if the poor little guy will talk to you. Enter the hole and see what you can find! Slow, yet profitable way to make nps. Click Here for more info. Will you pick the winning numbers? Costs 300nps. Can you find the treasure? Can you snag a prize? Check the help boards for TARLA posts! Yes. the reason you're all here! 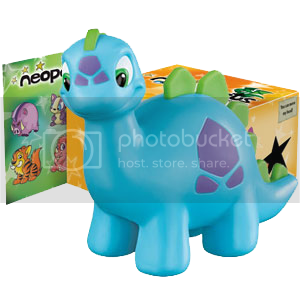 You want to know how the heck I make all of the neopoints that I do in a day, right? After I do my dailies, I play neopoint making games in this exact order. Follow it, and you can make just as much as me!! If there is a game that you think should be on this list, neomail me and I'll add it in. This is one of the easiest things that you could to earn at least 500nps. Takes no work at all. Just click start, go do other dailies, or play other games, and come back to spin the wheel. Do this 5 times. Easy Peesy! It's one of Neo's wheels, but the best thing about it is, IT'S FREE! And you can win up to 2000nps! Why not? A fun game of slingo. Click to release the ball, and see where it falls. Can't get much easier than this. You don't even need to dress your neopet to get points. Just start the game & end your game. Send your score and get 300nps each time. If you want an extra 100nps each time then send your neopet to a friend's email. Honestly...for an extra 100nps it's not even worth the trouble. But if you're down on nps, go for it! Fill in the crossword 3 times and win 600nps each time you send your score. Click here if you need help. Answer the daily question and win the amount of neopoints specified each day! Click here if you don't know the answer. Another easy one! YAY YOU! 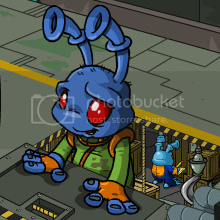 The point is to search through the crowd for the petpet which you are shown a picture of before each of the 4 segments. Find it, click it, send score! Yep! it's that easy! Answer 10 questions about being green! This game is all about your reaction time and reflexes! Throughout the 3 levels, it's your job to catch the bugs! The faster you catch them, the more nps you make! Choose any weapon. The type of weapon you choose does not affect your end score. Petchy's suggestions to add to your favorites each month. Best way to reach 813 is to use the bat. So first unlock the 3rd level. Once you do that, wait until the wind reaches 7 to 9 and click the left mouse button to hit the kass. Hold down the left mouse button while it's going up into the air, and as soon as it starts turning downward let go. Click on your player and drag him around making sure not to hit any of balls or walls. Be the first to race around the track and cross the winning line! No one lists this as a good np making game and I don't know why! It's easy, and it's a quick 3k! You have to save the kadoties. Keep piling the warfs on top of each other to build them up high enough to reach the kadoties. Answer a few Neo Related questions in hard mode until you reach 316 points. Collect gems as you soar through the volcano. Left click to drive the Scorchio up in the air, and release to drop him. In each level, pay close attention and count each and every potato that flies across the screen. Try not to get distracted by the other vegetables and items which try to trick you. At the end of each level, type in the number of potatoes you counted. I know! I know! Who wants to do math on their time off, right? WRONG! This game is super quick and easy. Choose division and potato counter and answer a few easy division questions! Quite the fun speller-bee game! If the word is spelled correctly press the up arrow. If the word is spelled wrong, press the down arrow. Kill all the Chia Bombers before they kill you. Use the arrows to move around, press spacebar to fire, and press M to drop a mine. Use your mouse to guide the rolling Yooyus to safety, while helping them collect the sun tokens and avoiding treacherous obstacles. Use the arrows to move around while being careful not to bump into any objects OR your components trail. Chase the music notes around to collect them without falling through the broken ice. Collect all the fruit and find a way out without being caught by the guard! A fun memory game. Watch carefully as the Techo plays out a sequence, then copy him in the exact same order. Move around and collect all but the red neggs. DO NOT TOUCH THE RED NEGGS! A fun little adventure game! Guide the Snuffly through the levels using the arrow keys and collect gems along the way. This game takes a lot of concentration. Make sure that your number lock is active, because you must use your number pad. Bop the ghosts by hitting the corresponding number on your numbers pad. Make sure to read the tips between levels as things change each time. Carefully follow the path with your mouse to the end, being sure not to hit the wire. Shoot at the rocks by left clicking on them. You can only use the same symbol as the rock to shoot each one though. So Use number keys 1 through 6 to change between symbols. Protect your men by completely surrounding at least one with snow blocks. Then shoot at your enemies. Yes, the score might seem intimidating, but this game is SOOO easy to rack up points! THe point is to clear the board of snot blobs. Every time you click on a blob, it shoots out a small blob in each direction. These blobs in-turn hit the first blob in it's way, and so on (like a dominos effect). Use the arrow keys to move and the space bar to fire your "laser" gun or push the blocks of moon rock. Shooting or pushing rock into enemies will kill them, and pushing moon rock into the lava will allow you to walk over it. Most don't realize just how profitable this game really is. Sure it's time consuming, but who doesn't love a good competition?? Key Quest is a fun multi-player board game which requires you to move around the board and collect each key. Once you have acquired all keys, make your way over to the door to unlock it. The first person to get to the door with all keys gets a gold key, and top prizes. Second person gets a Silver key, third person gets a Bronze key, and the 4th gets a lead key. All players get prizes and the neopoints they earn during game play though, so you've got nothing to lose! AND Unlike other games on Neopets, you can play Key Quest all day long! The only catch is that you can only use 10 keys a day. ATTENTION: STOCKS ARE NOT JUST FOR RICH NEOPIANS! They help you get rich! Indeed they do! Many of you out there don't participate in stocks because you think that you don't have enough neopoints to buy stocks. WRONG! The maximum you can buy each day is 1000 stocks. The cheapest you can buy stocks at each day is 15nps. So, you'd be spending roughly 15k a day(15 x 1000 = 15,000nps). This guide shows you how to make WELL over 15k a day, so there is no excuse as to why you cannot buy stocks each day, and still have nps left over each day to bank. FYI: There is no point buying less than 1k worth as the profit is not very high. 2. Selling at a Goal: Set a goal for yourself. ALWAYS buy low (15-17nps). The lower you buy, the higher the profit when you sell. This strategy takes a long time, so it requires that you have patience. Personally, my goal is 60nps. It's high enough to appreciate the profit, and low enough not to have to wait FOREVER! haha but Many players wait for 70+ (some even for that rare 100). 3. Stagger Selling: This strategy requires that you have a few thousand shares in a stock, and you sell shares at different high points. For example, let's say you have 8k in one company. When it hits 60nps/share, sell 2k, and hold the rest. When it hits 75nps/share, sell another 2-3k and hold the rest. When it hits higher, sell the rest! This is a great way to make high profits, and there's not much risk involved, because if it at least hits 60, and starts going down, just sell the rest so not to lose out on the high. Sniping is a great way to make thousands of neopoints a day. It can be done using both the regular Shop Wiz, as well as the Super Shop Wiz if you have Premium. The point is to find a shop with an item at a lower price than normal, buy it, and sell it at regular price for a profit. There isn't a specific amount that you SHOULD have on hand. It all depends on what you're sniping. Personally, I keep about 100k on hand, but you can keep less or more. FYI: According to TNT, sniping is not against the rules, it is completely legal. So, it is NOT considered cheating. If someone were to ask you for the item back because they realized that they mis priced it, you do not have to return the item. You bought it, fair and square. 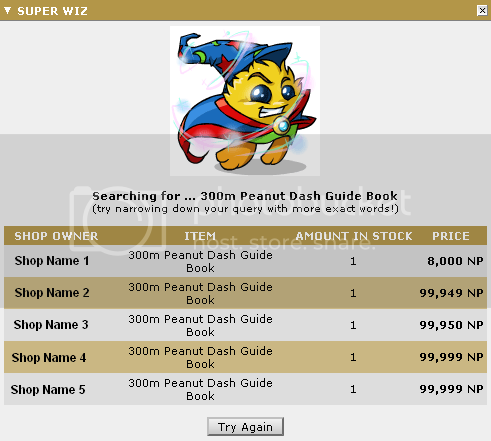 Regular Shop Wiz: To use the shop wizard, just type in the item you are looking for, and click search. It will then bring up 20 shops with the item in stock. With the regular shop wizard, shops are grouped together by owner names which start with the same letter. Press refresh for a different group of shops, and look out for shops which have the item priced MUCH lower than other shops. The above image is a great example of a good snipe. So keep searching for new items, and continue refreshing until you find a good snipe. Super Shop Wiz: The SSW definitely has it's advantages. Unfortunately, it is only available to Premium Members, and can be found on your portal. What is so great about it? Well, unlike the regular shop wizard, the SSW brings up a list of the shops with the lowest priced items. It does not group shops together by owner name. The SSW is used just like the regular shop wizard. Type in the item, and press search. The above image is a good example of a good snipe using the SSW. Unfortunately, there are a couple limitations to using the SSW. It gets tired much quicker than the regular shop wiz. This is to be fair to non-premium members. When this happens, just wait until the next hour. So, if the SSW gets tired at 1:30pm, it'll tell you to wait 30 minutes. You can use it again at 2pm. Another limitation is that you cannot search for Paint Brushes, Transmogrification Potions, Lab map pieces or Nerkmids (use the regular Shop Wizard for these items).